In Maharashtra one would find Hanuman temples spread across evenly in cities as well as villages. Temples in villages are more beautiful compared to the one found in cities as they are located in natural surroundings away from the crowds. In Maharashtra one will find major celebration in areas like Alibaug, Panvel, Karnala, and Khed. The birth of Hanuman or Hanuman Jayanti is celebrated with great devotion in Panvel. Here one would find popular temples like Panchmukhi Shri Hanuman temple, Saibaba temple and Shiv temple. Different religious festivals like Hanuman Jayanti and Shiv Jayanti are celebrated with great fervor in these temples. Also at the beautiful village of Pargaon near Panvel there is a Hanuman temple where Hanuman Jayanti is celebrated giving importance to spiritual part of the celebrations. Devotees start visiting these temples since dawn and listen to the Kirtan and Parayan describing the great happenings in the life of Shri Hanuman. Kirtans are organized at temple a day before the Hanuman Jayanti which continues throughout night till early morning as lord Hanuman was born at sunrise. A special prasad called sunthavda prepared from dried ginger is distributed to the devotees. Hanuman, the great devotee of Shri Ram, is worshipped for his strength and valor. In northern India Hanuman Chalisa which was composed by Sant Tulsidas is recited praising the qualities of Shri Hanuman. In Maharashtra Hanuman Strotra which protects the devotees from evil powers is regularly read by the devotees of Shri Hanuman. Hanuman Jayanti have a special touch and importance at Varanasi. At Sankat Mochan Hanuman temple in Varanasi there are huge celebrations of Hanuman Jayanti which lasts for five days. These celebrations are accompanied with musical and cultural events presented by reputed artistes coming from different places in India. Hoards of devotees visit the temple during these five day celebrations. 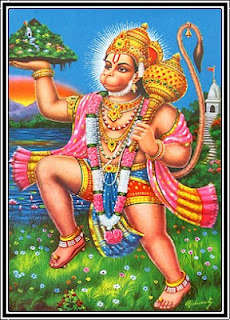 This year Hanuman Jayanti will be celebrated on 6th of April 2012. One can take part in these enchanting celebrations of Hanuman Jayanti. Panoramic resort Karnala invites its guest to visit Panchmukhi Hanuman temple in Panvel.